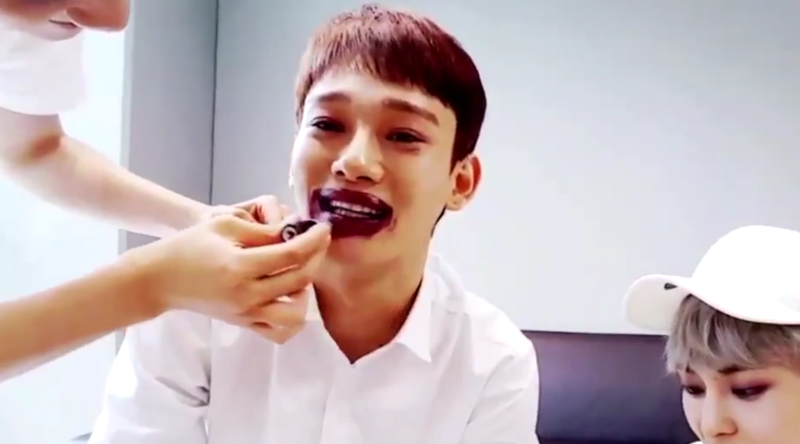 On a recent V Live broadcast, Chen of EXO was having his lips overdrawn to make them appear thicker, presumably for comedic effect. During that process, he laughed while comparing the look to Kunta Kinte from ‘Roots‘ and also Michol from ‘Dooly The Dinosaur‘, which has understandably drawn anger and criticism for playing into stereotypes and mocking those features. Did Jongdae say KUNTA KINTE? There’s shielding and debate going on right now because the V Live subtitles clearly wanted to avoid mess and translated it as “my lips look too plump”, but if you listen to what he actually says it’s quite clear he makes the reference to Kunta Kinte, and the Korean subtitles reference Kunta Kinte as well. If that isn’t enough, then there’s the fact that he then immediately references Michol, who is essentially a blackface character anyway. It’s as if he purposefully made the extra effort to make his intention crystal clear. It’s, uh … a bad look.